If you need to convert some kind of file to PDF format for free, you might come across PDF Maker. At the time of research, only Google Chrome users could download the extension, and it was available at the Chrome web store (chrome.google.com/webstore/detail/pdf-maker/lpmedofaljioejmmdbbdbkadeenbgjcf). Although portal.pdf-maker.com is presented as the official creator of the app, this website does not offer an installer, and it does not even mention the extension. According to our research, the installer of the extension could also be introduced via adware servers, which you could be redirected to via unreliable websites (e.g., illegal video streaming sites). The extension could also be bundled with other suspicious programs. In any case, if the suspicious PUP (potentially unwanted program) is active, it is strongly recommended that you install a malware scanner. If it is legitimate and up-to-date, it will be able to help you figure out if you need to remove malicious threats or other PUPs. Hopefully, you discover that you only need to delete PDF Maker. 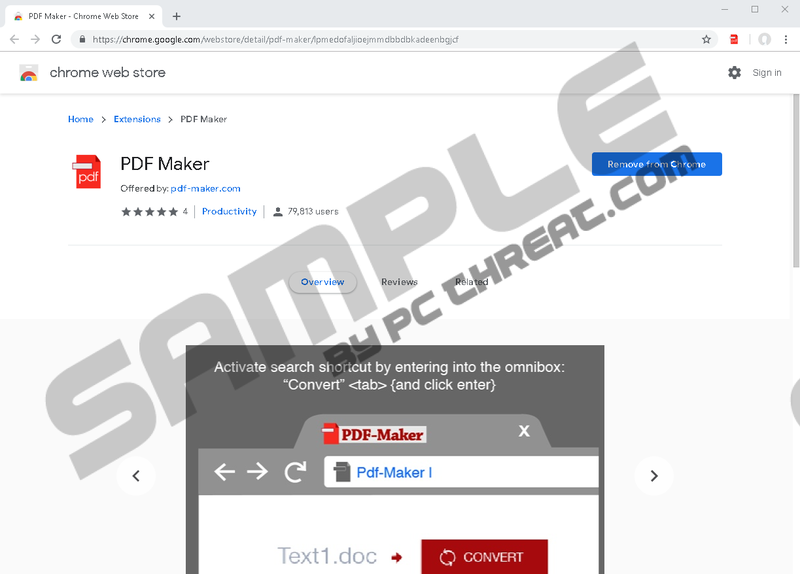 PDF Maker can “Read and change […] data on all pdf-maker.com sites, .pdf-maker.com, and pdf-maker.com,” as well as record browsing history, and change search settings. Users who download the extension from the Chrome web store are informed about all of this via a pop-up that shows up as soon as the “Add to Chrome” button is clicked. What does this all mean? The fact that the PUP can record data and browsing history suggests that it was created for the purpose of collecting information. After all, the services of file conversion should not be affected by the sites you visit or your search history. The fact that the PUP can change search settings, indicates that it modifies the browser in some way. According to our research, PDF Maker affects the default search provider. Although, at first sight, it appears that the change is necessary so that the user could access a PDF converter faster, things are pretty strange. If you enter “PDF” into the address bar, then tap the Tab/Space key, and then finally tap Enter, you are redirected to portal.pdf-maker.com. What’s the point of that? If you want to access the website, bookmark it and delete the PUP. If you do not use the keyword and keyboard key combination, the default search provider is affected anyway. Your search queries are redirected via feed.pdf-maker.com to search.yahoo.com. This is pretty bizarre, and that is why many Chrome users remove PDF Maker as a browser hijacker. After all, it redirects searches to a third-party engine without any permission. Of course, Yahoo Search is a legitimate search engine that can show trustworthy search results, but the thing is that results can be modified. As our researchers have found, the PUP records information and shares some of it with third parties, which are likely to be advertisers. They could be unreliable too. If they obtain information regarding your searches and preferences, they could use that to introduce you to advertisements via the search engine. This is very sneaky, and since that has nothing to do with the service that is offered originally, we definitely recommend deleting PDF Maker. Can you find and delete Chrome extensions? If you can, removing PDF Maker should be a piece of cake. If you are not familiar with the process, the guide below will show you the way. It is a good idea to clear browsing data afterward to ensure that cookies and cache are cleared as well. That will ensure that no one spies on you and leaks data about your virtual activity again. Note that cookies and similar data-tracking tools are completely normal, and most services and websites use it, but those that belong to unreliable or malicious programs should not be ignored. What about additional threats? Did you find any? If you did, you might be able to clear your system all by yourself, but you can also use anti-malware software. 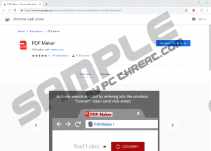 It will automatically delete PDF Maker along with other PUPs or malicious infections, and you will not need to worry about letting in other threats in the future. If you want to ask us something else, use the comments section below. Choose the time range (All time). Quick & tested solution for PDF Maker removal.